During egg storage, egg contents change and the speed of change largely depends on the outside conditions. Condensation of eggs should be avoided at all times to prevent bacterial contamination as much as possible! Due to variable market demands for day old chicks in the poultry industry it is common that hatching eggs are stored before incubation starts. Eggs are stored at the breeder farm before they are transported to the hatchery. After arrival at the hatchery, it normally takes a few days before the eggs are set in the incubators. At both locations eggs are stored in a storage room, where the temperature and relative humidity is controlled. If the storage period is less than 7 days a storage temperature of 16 to 18°C is advised and if the storage period is longer, a temperature of 10-12°C is mostly recommended. 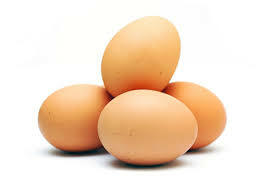 To prevent water loss from the eggs, the relative humidity in the storage room is kept between 70 and 80%. Despite of the climate regulation in the storage room it is commonly known that hatchability declines if the storage period is longer than 7 days. On the other hand it is also known that early embryonic mortality increases if eggs are set on day of oviposition. A short storage period of 3 to 4 days seems to be necessary for a good hatchability. In practice, longer storage periods are sometimes unavoidable. It is common known that eggs of young breeder flocks are better suitable for prolonged storage periods than eggs of older breeder flocks, because albumen quality in eggs of younger breeder flocks is higher. In nature, storage periods of more than 7 days are common as well, because a hen starts incubation when all eggs of a clutch are laid. Nevertheless the detrimental effects of prolonged storage periods in nature seem to be less than in artificial incubation. Consequently an interesting question is: what is the difference between storage in nature and storage before artificial incubation? Storage of eggs in nature seems to be simple. The eggs are laid in a nest and there is no regulation of temperature or relative humidity. Once a day the hen comes to the nest and lays an egg. While the egg is laid the other eggs in the nest are warmed for a short period. If a clutch of eggs is ended incubation starts. What happens in the egg during storage? After oviposition, an egg cools down to ambient temperature and an air cell is formed due to evaporation of water through pores in the shell. Carbon dioxide is released from the egg, resulting in an increase in albumen pH from 7.6 at oviposition to a pH of 9 to 9.5 within 4 days of storage and a decrease in albumen height. The yolk remains slightly acid during storage, at a pH around 6.5. The loss of carbon dioxide to the environment and thus changes in albumen pH and albumen height is dependent on length of storage period, storage temperature, transport of carbon dioxide thought the albumen, conductance of the eggshell and eggshell membranes and the concentration of the carbon dioxide outside the egg. One of the positive effects of the increase in albumen pH is the protection of the embryo against a bacterial invasion. Due to the relatively high increase of albumen pH during storage, a pH difference arises between yolk and albumen. This difference might be necessary to facilitate certain transport functions across the albumen and yolk to and from the embryo. A decrease in albumen height is necessary to meet the oxygen requirements of the embryo during storage and early incubation. Thus, a change in albumen quality during storage seem to be necessary to protect and support embryo development. The advise to decrease the storage temperature if the storage period increases, is to slow down the loss of carbon dioxide from the egg and to slow down the development of the embryo. Excessive loss of water during long-term storage has generally been reported to be detrimental for hatchability. The reason for this is not totally clear. 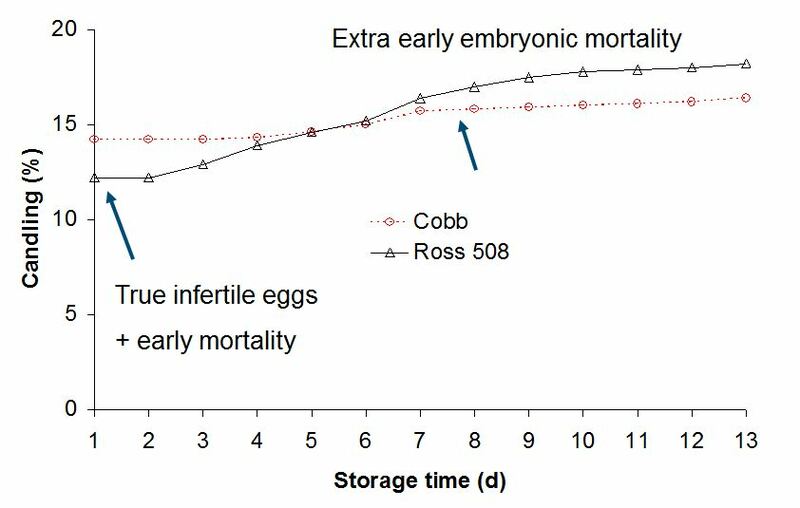 By controlling the temperature and relative humidity in the storage room the processes in the egg are slowed down, but probably not enough to maintain embryo quality after prolonged storage periods. There must be an other factor that is important to maintain embryo quality; see embryo viability. To minimise the entrance of bioburden inside the egg, it is important to prevent condensation of eggs. Therefore, it is important to understand the physics of condensation in relation to relative humidity and temperature. The amount of water vapour in the air at any given time is usually less than the amount required to saturate the air. The relative humidity is the percent of saturation humidity, which is generally calculated in relation to saturated vapour density. The most common units for vapour density are gm/m3. Example: Saturation vapour density at 20ºC, is 17.3 g/m3 and the actual vapour density is 10 g/m3, then the relative humidity is 10 / 17.3 x 100% = 57.8%. Daily activities and egg movement create variations in the egg room air temperature. While the air temperature can change fairly rapidly, the actual egg temperature is slow to change. This variation in egg room temperature relative to the actual egg temperature is what causes condensation on the eggs. If the temperature is constant and uniform, relative humidity control is not necessary. But in reality, there are variations in the egg room air temperature that can create condensation problems. In the comparison below, the effect of the relative humidity level is shown. For this example, assume that the set point of the egg room is 16.7ºC, but with the movement of eggs in and out of the egg room, the air temperature is actually 18.3ºC. In an egg room with an air temperature of 18.3ºC and 50% relative humidity, the actual vapour density in the air is low compared to the saturated vapour density, as defined by the relative humidity value. The dew point is 7.2ºC. This means that in 18.3ºC air and 50% relative humidity, the eggs must be at or below 7.2ºC for condensation to occur on the eggs. In a normal functioning egg room, there are no areas or times of the day where the egg temperature is 7.2ºC. In a normal egg room with these settings, condensation will not occur. At 18.3ºC air temperature and 90% relative humidity, the actual vapour density in the air is higher relative to the saturated vapour density. The dew point rises to 16.7ºC. At night when there are no open doors or activity in the egg room, the egg room will cool the eggs to 16.7ºC. In the day, when doors are open and outside air enters the egg room, the air temperature in some areas will be 18.3ºC. 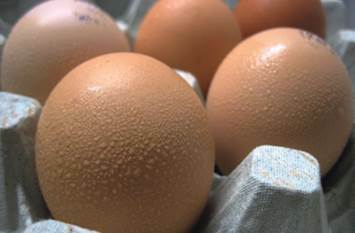 Condensation will form on the 16.7ºC eggs with 18.3ºC air temperature and 90% relative humidity. This small 2.6ºC change in egg room air temperature is normal in a hatchery egg room. There will be periods of condensation in an egg room with 90% relative humidity. Condensation on eggs occurs when cool eggs are moved into an environment that is relatively warmer and more humid. To prevent condensation on the eggs, the dew point of the environment that the eggs are moved into must be below the temperature of the egg. This is shown in the example below. When eggs from the storage room running at 20ºC are taken and placed inside the incubator running at 38ºC and 55% RH, eggs will sweat. Dew point temperatures for RH of 35, 55 and 75% are respectively 20, 27 and 33 ºC. So pre-warming eggs slowly to 27ºC would prevent egg condensation at the start of incubation. An alternative would be to start at low RH of for example 35%. Egg condensation will not only facilitate bacterial entrance, but also decrease the embryo temperature because the process of evaporation of water consumes energy. A psychrometric chart can be used to determine the dew point. On the page about ventilation requirements it is explained how dewpoint temperatures can be calculated. This Excel sheet can be downloaded to make your own calculations and to find out when eggs will start sweating.